Story Time! - Sukey Molloy! Welcome to Story Time! with Sukey Molloy. Sukey’s audio picture books are created in Sukey’s colorful felt art imagery and are the foundation of her award-winning Sukey’s Circle! video animations. Each book comes with a downloadable link for the accompanying title song. Appropriate for children ages 1-5. My audio picture book Where Does the River Go? is created from my colorful felt art images, and is the origin of my award winning animations on ‘Sukey’s Circle’. The song was first recorded on my ‘I Like to Sing’ CD, and remains a special early learning favorite. My audio picture book These Are My Eyes is created from my colorful felt art images, and is the origin of my award winning animations on ‘Sukey’s Circle’. The song was first recorded on my ‘Circle Songs’ CD, and remains a special early learning favorite. Be sure to subscribe to my YouTube channel to get all the updates, and see below to order the book! 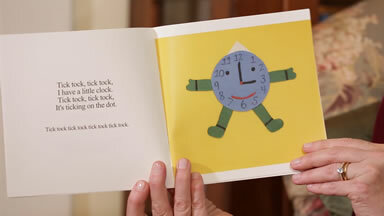 My audio picture book Tick Tock is created from my colorful felt art images, and is the origin of my award winning animations on ‘Sukey’s Circle’. The song was first recorded on my ‘Circle Songs’ CD, and remains a special early learning favorite. Each picture book comes with an accompanying song download. A link is included with the book.